The Erna Fergusson Library has rows of tables with power strips for the techno-fortunate who fetch their own machinery hither and thither. Today my “office” is at the Erna Fergusson Library on San Mateo. I pulled the early shift at the Northeast Heights Satellite Coffee outlet, because a day without a breakfast burrito is like a day without sunshine, and then moved over here to free up some parking space for the caffeine-deprived. I’d have used the Juan Tabo branch, which is closer to Rancho Pendejo, but it’s closed on Sundays. The phrase “your tax dollars at work” has become a punchline for eons, but I doubt it’s funny to the three dozen or so folks who were queued up outside in the hot sun, waiting for the library to open at 1 p.m. Most of them were in the line to use the facility’s computers. Having mine in a messenger bag — two of them, actually — I felt slightly yuppified and ostentatious. Imagine doing without the Innertubes and computers in this day and age. If you want to go low tech, that’s one thing; but having to is something else, especially if you’re trying to find, oh, I don’t know, a job or health care or child care or something. This entry was posted on September 28, 2014 at 2:13 pm and is filed under Albuquerque, Deep political thought, Techno-travails. You can follow any responses to this entry through the RSS 2.0 feed. You can leave a response, or trackback from your own site. As one of the librarian types I wish the library could be open 24/7 7 days a week but as you know we spend more on one bomb than we do on any services to the public. I love that you go to the library to work. I hope you enjoy living in NM. I had often thought it would be a great place to end up for Mark and I some day. My love to Shannon. Hey, Beth … just think how many “books” we’re dropping on Syria right about now. It’ll make you crazy if you let it. I’ll tell Herself you said howdy. How’s life out your way? Also (ahem), not all of the money at Rancho Pendejo comes from Le Bombe Factorie. The bike biz bears its fair share of the weight, though it must be admitted that in percentage terms, my contribution to our revenue stream has dwindled to a trickle. Certainly more so a case of total underwriting for us than for you, O’G…..
A public library is worth every penny it costs, and most cities should be throwing more money at them, not less. For real. More libraries, more smart people; more smart people, fewer dumb decisions. Or so it is to be hoped, anyway. Now that is my kind of breakfast venue too ! For those of us fortunate enough to have a few shekels for decent/ Real food, I will tailor my bike ride towards a leisurely stop there! Satellite Coffee is a great little outfit. A friend discovered it on a trip here and I’ve spent my java money there ever since. Our county had a chain of libraries that many of us can’t imagine doing without. Goes by the name Anythink. Most have huge kid-friendly zones, programs for all ages, pretty much something around the clock. And every day at opening time there’s a line outside the door, most of whom are using the computers to work on their resume, fill out job applications, or take part-time classes. My kids have spent I’m guessing 2 hours a week there for the past four years. I don’t know how you calculate value for your public-service dollar, but I feel guilty not paying a membership fee to belong to this fine institution. Our county has, not had. 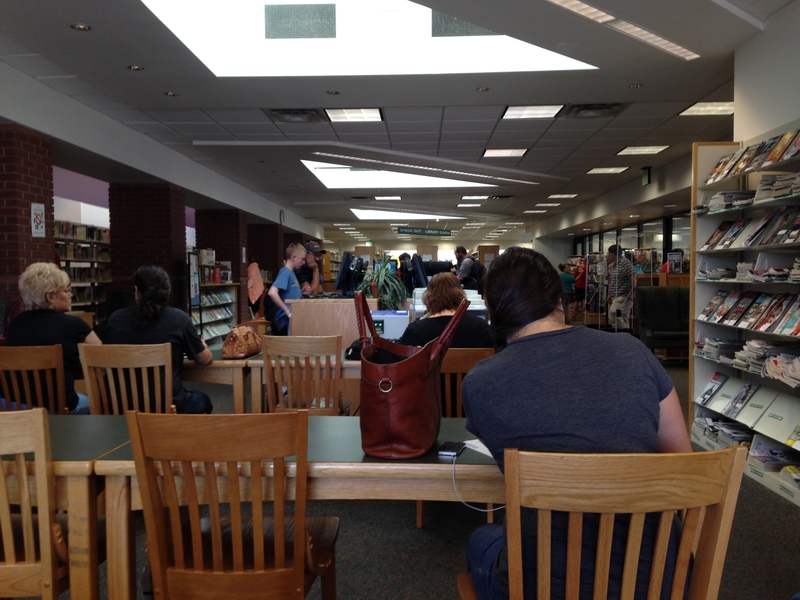 I love the library…always have. There’s just something magical about being around so many books. It’s like there is good karma all around you. Great use of tax dollars at work and they are evolving too to meet changing needs. I got my first library card when I was still in the womb. I’m getting one here as soon as our neighborhood branch opens on Tuesday. It’s closed Sunday and Monday, just like a motorcycle shop. Here at the American Academy in Rome, we have it pretty easy with WIFI covering pretty much the entire place but let’s hear it for libraries, especially as one of those employs HERSELF, thereby keeping you from living in a cardboard box with your cats? The local paper wrote a piece a while back about how ‘Burque has trouble keeping/attracting businesses downtown due to slow Innertubes and high prices. They’re talking about ramping up service along the downtown-UNM-Nob Hill corridor, but it’s gonna take a while. I’m surprised how slow the speeds are here compared to Bibleburg (10 Mbps, which is half what we had and a quarter of what was available), and how poor the cellular service is, both AT&T and Verizon. The latter is on a par with Crusty County back in Colorado, which has more cows than people. Sounds like you’re started to get settled in. I hope you get your innertubes access lined up soon. Looks like a decent library. Up here in The Peoples’ Republic they’ve become homeless shelters. Bit by bit, Debby. The movers are supposed to bring all our stuff sometime today. Naturally, the forecast is for heavy rain. Gah. Interesting thing about “homeless” folks here in Rome. Parked on the street less than 50 meters from the residence of the US Ambassador to Italy (he’s right across the street from the Academy) are small motorhomes or travel trailers with people living in them. Some of these things look new while others have flat tires and blue plastic tarps over them, but folks livin’ in ’em just the same. I’ve seen plenty of parking tickets and even the “boot” applied to cars all over Rome, but for some reason these “squatters” (I’d guess you’d call them?) seem to be unbothered. My guess is most of these folks work and take care of their hygiene issues elsewhere, but for some reason are allowed to live here. Pratt is best known for his establishment of the Enoch Pratt Free Library in Baltimore. Many residents of the City in late 1881 speculated what was being planned for the excavations going on in the north side of West Mulberry Street, by Cathedral Street, near the old Baltimore Cathedral in the toney Mount Vernon-Belvedere-Mount Royal neighborhood, north of the business district on Cathedral Hill. The mystery was explained when on January 21, 1882, in a letter addressed to the Mayor and City Council of Baltimore, Pratt offered a gift of a central library, four branch libraries (with two additional ones to be constructed shortly thereafter), and a financial endowment of (U.S.) $1,058,333. Further, he requested that to Mayor William Pinkney Whyte and the Council continue an annual appropriation to the new library system and support it in the years to come to supplement the interest and benefits accumulating from the principal of his bequest. His intention was to establish a library that “shall be for all, rich and poor without distinction of race or color, who, when properly accredited, can take out the books if they will handle them carefully and return them.” The grant was accepted by the municipal government, approved by the General Assembly of Maryland with some enabling legislation, and approved by the city voters later that year in an election/referendum on October 25, 1882. After four years of plans, construction and the hiring of staff with the purchasing of many books, the new library was ready to be opened in January 1886 with some appropriate addresses at ceremonies at the nearby Academy of Music on North Howard Street, and opened to new patrons and business the beginning of February 1886. As a public library trustee and former (hopefully future) public library director Patrick your article and all the comments made my year. Public Libraries do a lot with very little in face of some real active hostility.